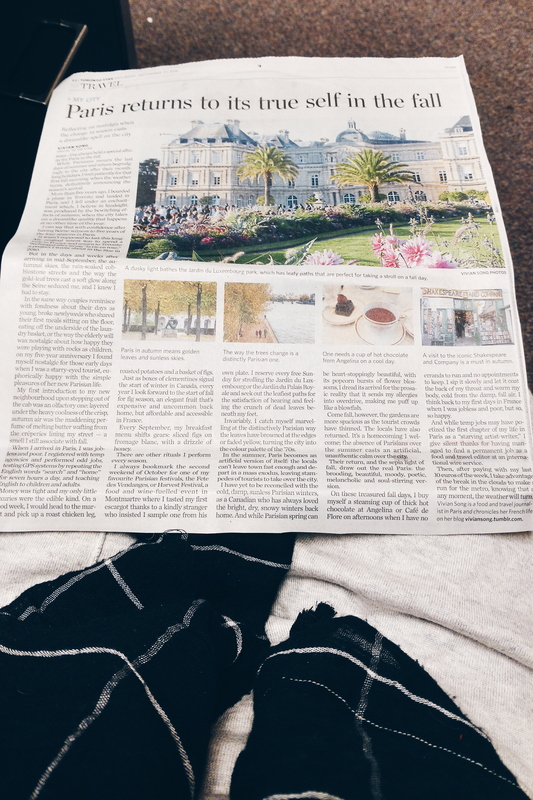 Today, a co-worker passed me an article from the Toronto Star by a writer named Vivian Song who wrote that, ‘Paris returns to its true self in the fall’. The article was passed to me as a reminder of what awaits, and while it inspired me, it also made me melancholy. Autumn is my most favourite time of year, and Song wrote about Autumn in Paris with such a dreaminess that my heart ached as I read it. Why am I not in Paris, sipping hot chocolate on cool days at Cafe de Flore, under yellowing trees, readying myself to attend the Harvest festival in Montmatre? What am I waiting for? What other signs do I need to make the jump? What is taking me so long? I’m feeling extra emotional at the thought of following my dreams as I realize how short and precious life truly is. My grandmother has stage four liver cancer, and she’s reaching a point that doesn’t look positive. She’s been a pillar of immense strength since her diagnosis, full of laughter and positivity and constantly making me crack up with her jokes and her sarcasm on our phone calls. She’s lived a full life and has seen grandchildren and great grandchildren grow up. She has shared with me ageless wisdom. She has been through things I can’t even imagine. She has watched the people she loved and who she grew old with pass away. She has truly lived. But I remember being young and going to the Montreal zoo with her. And I remember yearly Christmases with her. And I remember when she was well enough to make the most amazing taralli (Italian food), and these twists of fried dough with powdered sugar on them that I would kill for. And those moments feel like just yesterday, but they are not, and I’m left wondering where time has gone. And so, am I wasting time agonizing for Paris from thousands of miles away? I don’t want to regret my life, just because I let moments and opportunities pass me. That’s one of the main reasons why I jump at job postings or applications that center around my passions, or speaking to my passions, or those which involve opportunities that I feel will benefit me, experience wise. I don’t want to miss those chances to maybe do something really great. I want every moment to count and I want to try my hand at everything I can. I’m a dreamer, after all. And so why do I wait for Paris? Why do I slowly let this opportunity pass me, and risk that I might reach a moment where the dream isn’t available to me anymore? Asking myself these questions makes me really upset, and also makes me feel a little less confident. I pride myself in being impulsive (it’s allowed for some amazing things to happen in my life – like my relationship with my partner), but what holds back the impulse, this time around? Sherway Shopping Spree! + Shop this look #3!